Cockbirds, also known as Ring Necked Pheasants are amazing gamebirds. These colorful and crafty birds are not native Montanans. They would never win a Political office or be called true natives. Pheasants are immigrants. These Asian natives were introduced into America in the late 1800’s near the Willamette valley of Oregon. Eggs and some adult birds were sailed across the Pacific Ocean and released into their new home. They quickly spread across North America to Pennsylvania. A 2-3 state wide belt of states now had pheasants on their menus. Soil, habitat, weather, and food determined where they would thrive. Pennsylvania had superb pheasant hunting through the 1980’s that matched any state. 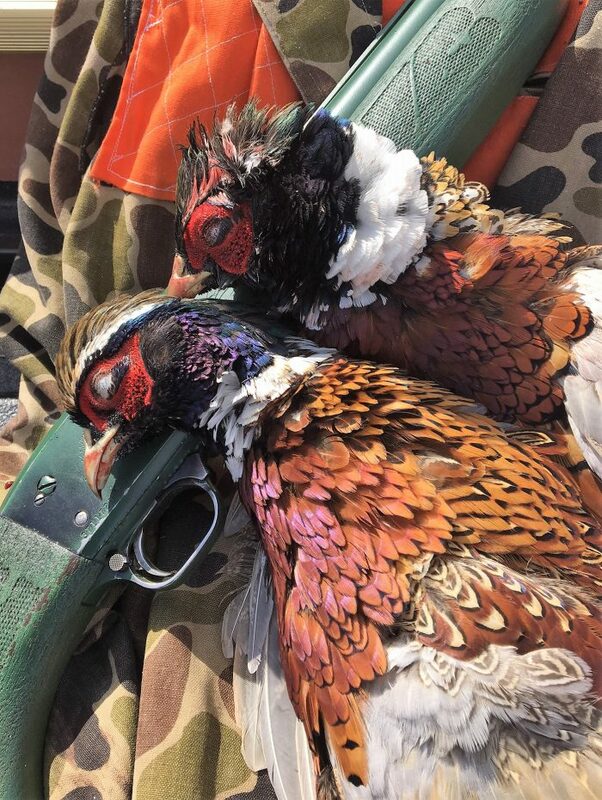 With the change in farming practices, herbicides, insecticides, no-till farming, year around hay mowing, loss of habitat, and predation, pheasants are all but gone in much of their original range. Eastern states such as Maryland, Pennsylvania, Ohio, Indiana, and Iowa have lost most of their wild bird populations. Game farms and stocking offer a glimmer of pheasant hunting at best. Montana pheasant hunting is alive and well. Watersheds and grain fields offer superb habitat. Smarter farming and management have maintained quality pheasant opportunities. This year’s population was damaged by hail and severe winter and spring weather. Despite these setbacks, birds can be found. I took my shorthaired pointers Magnum and Shelby out for a quick hunt the other day. After an hour, we had 2 cockbirds in the bag. Both dogs had a point and a retrieve. Other hens were flushed and several immature birds that were not fully colored. Successful bird hunters need to understand how to hunt pheasants. They are not everywhere. They are always moving and need to be hunted. Skilled shooting is also a must. Be certain to mark the spot where the bird falls. Go right to the area and hang your hat on the cover. Now make circles until you find the bird. These magnificent birds are to good to waste. Always wear safety orange when hunting birds. Orange should be on your hat and vest.